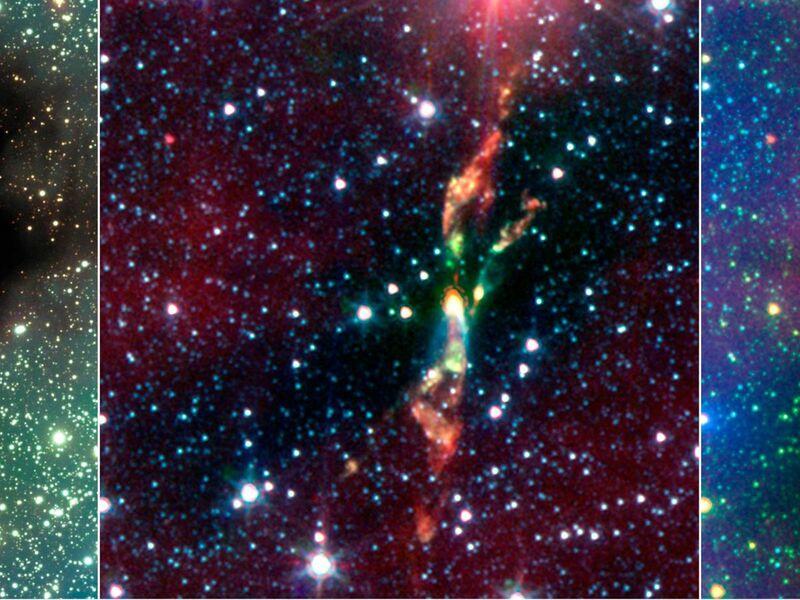 Two rambunctious young stars are destroying their natal dust cloud with powerful jets of radiation, in an infrared image from NASA's Spitzer Space Telescope. 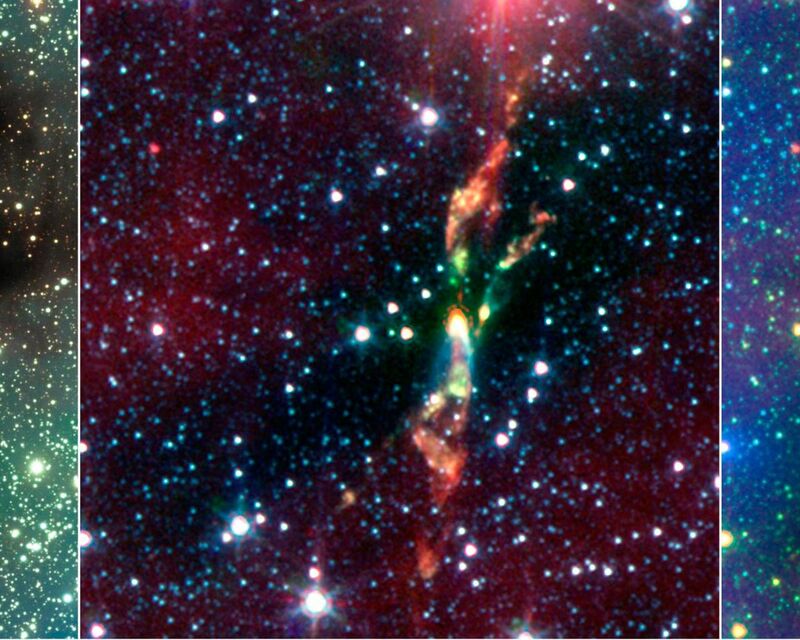 The stars are located approximately 600 light-years away in a cosmic cloud called BHR 71. In visible light (left panel), BHR 71 is just a large black structure. The burst of yellow light toward the bottom of the cloud is the only indication that stars might be forming inside. 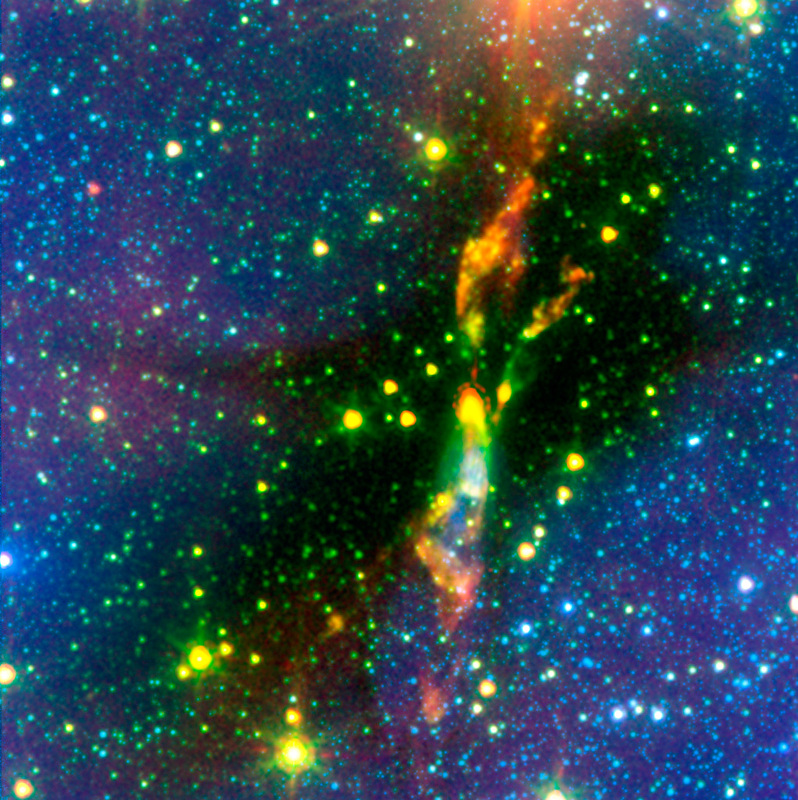 In infrared light (center panel), the baby stars are shown as the bright yellow smudges toward the center. Both of these yellow spots have wisps of green shooting out of them. The green wisps reveal the beginning of a jet. Like a rainbow, the jet begins as green, then transitions to orange, and red toward the end. 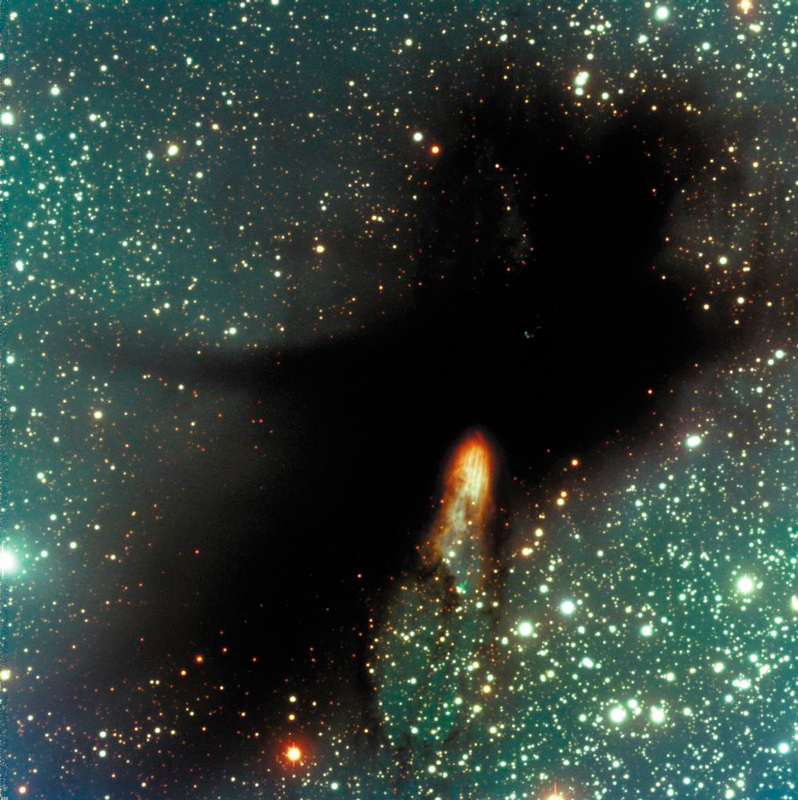 The combined visible-light and infrared composite (right panel) shows that a young star's powerful jet is responsible for the rupture at the bottom of the dense cloud in the visible-light image. Astronomers know this because burst of light in the visible-light image overlaps exactly with a jet spouting-out of the left star, in the infrared image. 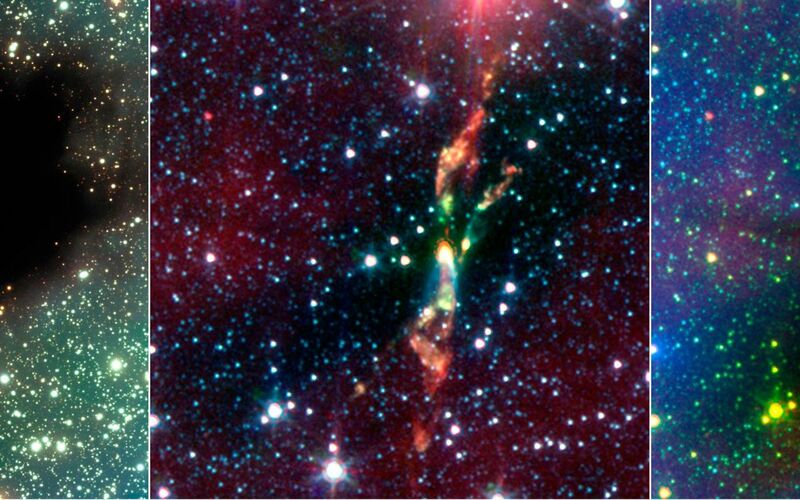 The jets' changing colors reveal a cooling effect, and may suggest that the young stars are spouting out radiation in regular bursts. The green tints at the beginning of the jet reveal really hot hydrogen gas, the orange shows warm gas, and the reddish wisps at the end represent the coolest gas. The fact that gas toward the beginning of the jet is hotter than gas near the middle suggests that the stars must give off regular bursts of energy -- and the material closest to the star is being heated by shockwaves from a recent stellar outburst. Meanwhile, the tints of orange reveal gas that is currently being heated by shockwaves from a previous stellar outburst. By the time these shockwaves reach the end of the jet, they have slowed down so significantly that the gas is only heated a little, and looks red. The combination of views also brings out some striking details that evaded visible-light detection. For example, the yellow dots scattered throughout the image are actually young stars forming inside BHR 71. 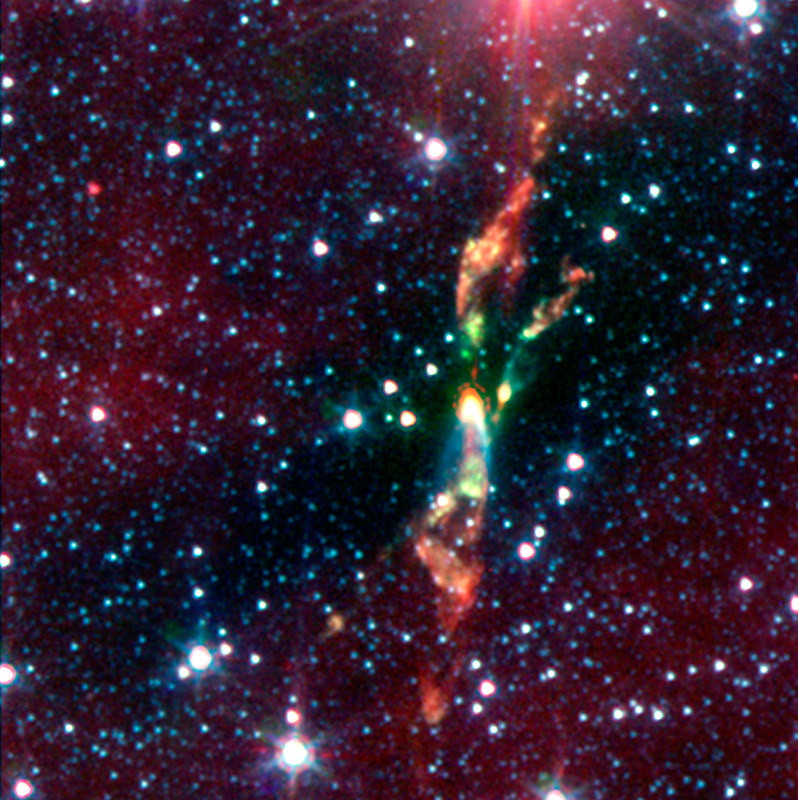 Spitzer also uncovered another young star with jets, located to the right of the powerful jet seen in the visible-light image. 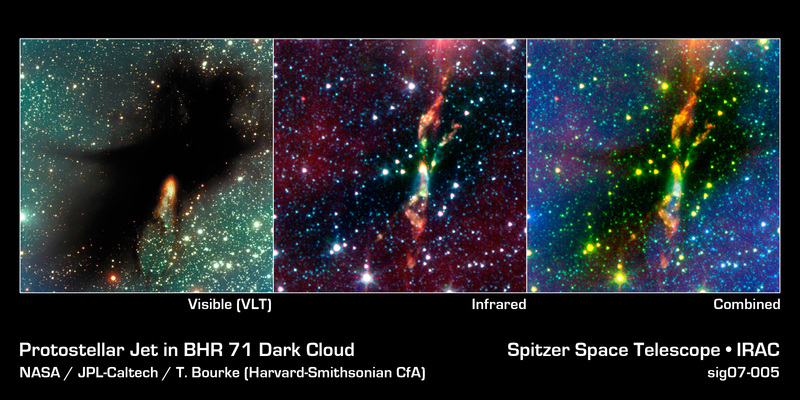 Spitzer can see details that visible-light telescopes don't, because its infrared instruments are sensitive to "heat." The infrared image is made up of data from Spitzer's infrared array camera. Blue shows infrared light at 3.6 microns, green is light at 4.5 microns, and red is light at 8.0 microns.